Will you resist temptation to download a theme that boasts premium quality functionality for free? Today, you have such an opportunity! One of the leading providers of ready-made website templates and quality web design stuff, TemplateMonster updates its inventory with freebies once in a while. Their gallery of pre-made WordPress designs is vast and diverse. Free WordPress templates also appear in their collection quite frequently. So, today we would like to focus your attention on one of such freebies – Kustrix Lite. As you could have already guessed from the title, this is a free and somewhat simpler version of a premium WordPress template baring a similar name. Although Kustrix Lite is free, it looks and feels almost similar to its premium cousin. One of the peculiar features of both templates is GPL license. The latter gives you the freedom to install one and the same template on an unlimited number of web projects, as well as tweak its code in a variety of ways. When you download a template licensed under GPL, you get absolute freedom to decide how and where to use it. Of course, certain modifications of its look and code are required. 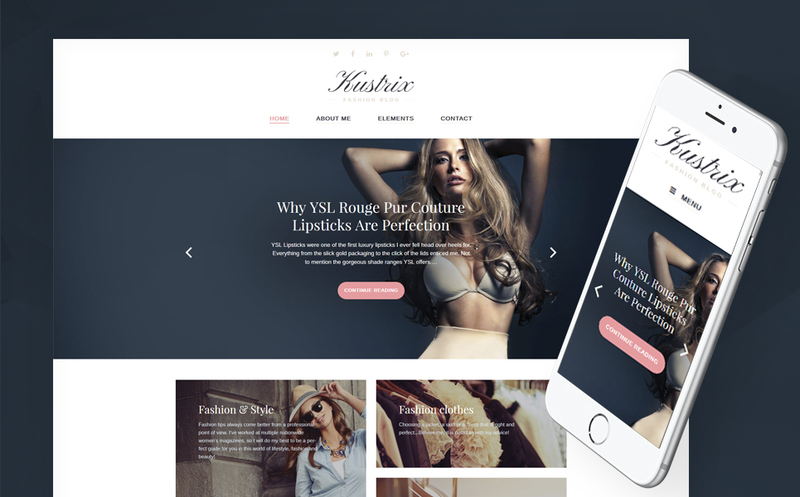 Kustrix Lite is a free WordPresss template running on a fully responsive framework. Similar to the rest of the themes from TemplateMonster’s gallery, it is SEO-friendly and crossbrowser compatible. Designed and developed as per the latest web standards, the theme boasts a trendy and stylish look. The theme is primarily intended for building fashion and beauty related blogs. A clear and easy-to-browse layout is designed with the focus on content. Visual and written data are well-balanced on the page. Due to the 2-column layout structure, there is enough space to share the latest blog updates and additional navigation elements. The main navigation panel of the template features drop-down functionality. The logo is surrounded by whitespace, which brings it to the foreground. Right above the logo, there is a set of social media options guiding the users to your official Twitter/Facebook/Instagram/Pinterest/Google+ profiles. A page-width carousel in the header of the theme’s front page welcomes the web audience, inviting them for a deeper investigation of your content. Advanced blog search, tag cloud, blog archives, a drop-down menu with categories, recent posts, recent comments, and a calendar widget are located in the right sidebar of the theme. No matter if you browse the front page or read a blog post, all of the aforementioned elements remain always accessible to the readers. In such a way, people have unlimited access to any kind of data they are interested in at any stage of the blog navigation. That’s what you can notice when watching the theme’s live demo. Now, let’s take a look at what can be found under the hood. First and foremost, Kustrix Lite is enhanced with WordPress Live customizer. This is a handy tool custom-made by TemplateMonster’s WordPress team. With its help, you can apply changes to the theme’s layout and watch them live, without the need to reload the page. WordPress Live Customizer is featured in both premium templates and this freebie. Thus, you can try how it works and feels before you decide to get a premium template. The carousel slider that we were talking about earlier in this post is called Smart Slider. Added to both premium and free GPL themes from TemplateMonster, it is fully responsive. 100% editable, it can be enhanced with any type of content you can think of. Both images and videos are supported. Texts, CTAs, and transition effects can be tweaked in a number of ways. The thing that should be mentioned here is that images in TemplateMonster’s GPL themes are used for preview purposes only. They are not included into the download package. So, you will need to upload your own visual content after the theme’s installation. 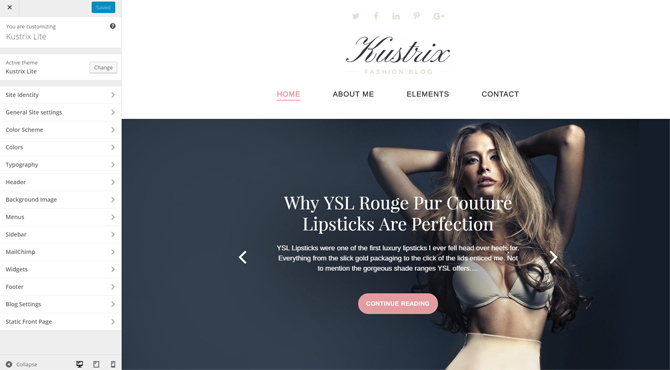 Kustrix Lite is a functional ready-made theme that is intended to help you get started with a blog out-of-the-box. It includes a pre-designed home page and a set of additional pages. You can tweak their presentation in a way that matches your brand or according to your liking. In addition to the extensive set of customization options, the theme supports a number of custom post types like audio, video, image, quote, aside, status, etc. All of them can be enhanced with additional features, labels, and other specs. Blog posts are accompanied with sets of social sharing options. The functionality is added to both the homepage and each blog post. Thus, people can spread the word about their preferred piece of writing with one click only. Moreover, Kustrix Lite is integrated with a commenting system. The functionality can be found below each blog post. On the preview page, the users can see the number of comments that every publication has received. There is a possibility to choose from page-width and small featured images. On the preview pages, the users can see the name of the post author as well as the publish date, tags, and categories. Each of these elements can be displayed or hidden via the theme’s admin panel. Due to the flexible widget areas you can enhance your blog with a number of additional elements like calendar, tag cloud, comments, social media feeds, archives, and many others. Similar to the rest of the design elements of this template, the widgets can be managed via WordPress Live Customizer. When it comes to running a blog, it is highly important to keep the audience informed on your updates. A newsletter subscription form is intended to keep people always informed on your new publications. The form is simple in use. A person only needs to enter a valid email address to subscribe to the newsletter. A contact form is also provided. So, your readers will always have the freedom to reach you out with a question, suggestion, reflection, etc. Our Team, Services, Portfolio, and Testimonials pages are also added to the theme’s pack. In such a way, you can use it not only for fashion blogs, but also for a number of other personal or business purposes. A separate page with user testimonials is intended to grow the reliability and credibility of your web resource in the eyes of your target audience. Basically, that’s all that we wanted to say about Kustrix Lite – free GPL WordPress Theme from TemplateMonster. As you could have noticed, its functionality and visual presentation can bring the freebie in one row with premium products. And these are not just loud words. Go ahead, download the theme, and see it for yourself!